Yep. All of it. Full-length streams and downloadable 192 kps mp3 versions of all tracks are now available for free. 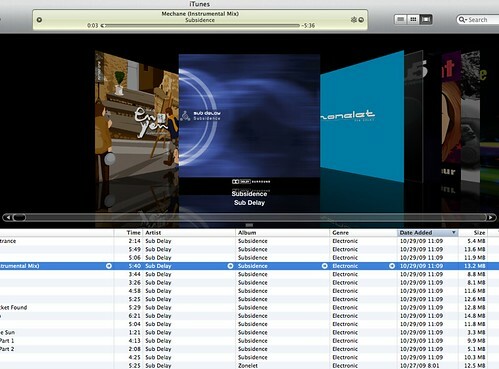 Tracks can be downloaded individually or as an album package complete with full-color artwork. I encourage everyone to download and share the free mp3s with as many people as possible! Of course, for those who care a little bit about sound quality, high quality 320 kps and FLAC versions are also available as paid downloads, with CDs going to become available soon. Anything posted on the blog, Facebook or Twitter related to Sub Delay will be aggregated and shown on the site so you can also stay up to date with the latest Sub Delay news. As mentioned, we are consolidating all our music under the name "Sub Delay" and the artwork for the albums has been redone to reflect this fact. The two Zonelet EPs have been combined into one full-length album including a new track "Inlet". Also, album covers are now embedded into the audio files so they look great when played in iTunes or on your iPod/iPhone/iThing. 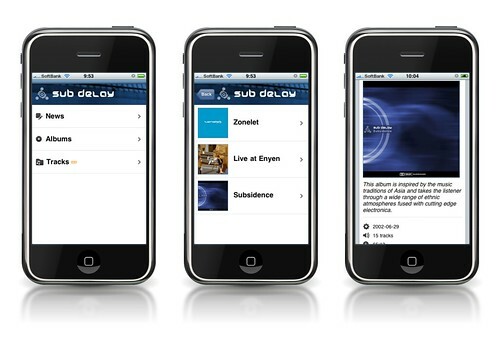 I love my iPhone just as much as the next guy so it only seemed natural that the new site should support this format. Accessing the site with an iPhone or iPod Touch will present you with an optimized interface that takes advantage of the device's touch screen capabilities. A bit ironic given it seems like only days ago I was writing about implementing the site using Flex, but even though a working Flash version was almost completed, after a while I realized that it would be much more efficient to do the whole thing in good old HTML (thus the 3.1 version number). If you haven't done so already go and check out the new site (and music!) 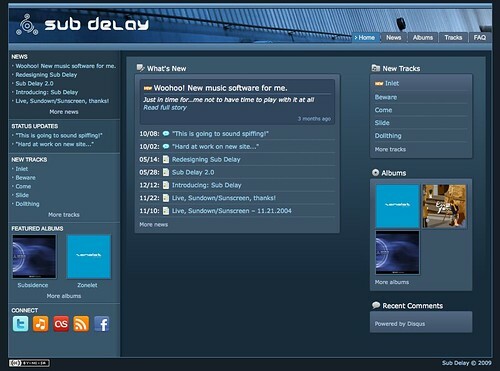 at www.subdelay.com (if the new version doesn't show up at first try refreshing your browser a few times).